Plans for a possible third River Thames crossing in Kent have moved closer after the government said it would look at the issue, a council has said. Kent County Council (KCC) said growing traffic between the UK and Europe was having "major knock-on effects" on congestion at the Dartford crossing. The leaders of Kent and Essex county councils have welcomed the government's announcement. A Kent County Council study will now focus on traffic between the counties. Essex County Council leader Lord Hanningfield said the government study was welcome, but "long overdue". And on Thursday, Kent County Council leader Paul Carter said it was time the counties said "enough is enough". The authority has said the rail or road link would provide a link between the A2 in Kent and the A12 in Essex, perhaps crossing the estuary at Dartford, Gravesend, Sheppey or Grain. The council said more than two million lorries passed through Dover each year, of which 1.5 million were foreign lorries. 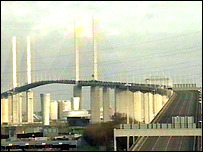 It said 17,000 HGVs used the Dartford crossing each day. A spokesman said: "The route from Dover to the M11/M1 is vital for road freight and tourism traffic between the UK and the rest of Europe. "Congestion on that route is having major knock-on effects." Last week, Transport Minister Stephen Ladyman announced a review of the Dartford crossing toll system and said: "Traffic pressures at the crossing will continue to get worse. "I have therefore requested a study of how we can best address traffic pressures in the longer term, including the possibility of a new crossing."